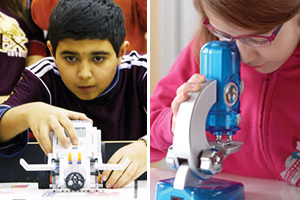 The Faculty of Education at the University of Ontario Institute of Technology offers a variety of unique summer camp programs in July and August. New tech camps have been added this year. A low camper to counsellor ratio ensures maximum involvement. Three weeks are available as “Girls Only” which allows them to share their interests in science, technology and the environment with like-minded girls. Camp programs make use of laptops, digital cameras, science and engineering equipment, and iPad technology. Campers share the equipment. Each camp has a different focus and theme. All camp sessions include outside games and activities. An Indigenous perspective has been infused into the STEAM camps with campers learning cultural aspects through Knowledge Keepers. Supervised extended care is available for an additional fee. Times are from 8 to 9 a.m. and 4 to 5 p.m. Meal plans are available for an additional fee. Download the Summer Camp Brochure. You can find complete information about dates and registration using the left navigation menu. NEW: Tech Camps – Two new tech camps for younger campers have been developed to allow campers to explore a variety of tech tools and activities. NEW: Advanced Coding and Game Development – We are working with UOIT Faculty of Business and Information Technology (FBIT) and will hold two advanced sessions in their Game Development and Virtual Reality lab! NEW: Cyber Girls Ambassador Program – In conjunction with the UOIT FBIT program, young women will become “Cyber Girls Ambassadors” through this one-of-a kind mentorship program teaching girls the fundamentals of cybersecurity and digital citizenship. Counsellor in Training – This year we are expanding this program for teens who are interested in becoming “junior counsellors” at the UOIT summer camps. Counsellors-in-Training (CITs) will receive training on the different camp programs and then have the opportunity to volunteer for several weeks in the camp. These hours can count towards high school volunteer hours. CITs must have finished Grade 9. NEW: Educator sessions – Building on the success of the Teacher workshops in 2018, four modified sessions have been developed for educators. These include: Tech4Teachers, Turtle Island for Educators, Creating a Makerspace 1.0 and Creating a Makerspace 2.0. Family camps: Five days of camp programs provide families with ideas for infusing science, technology, engineering, art and mathematics (STEAM) into their activities.